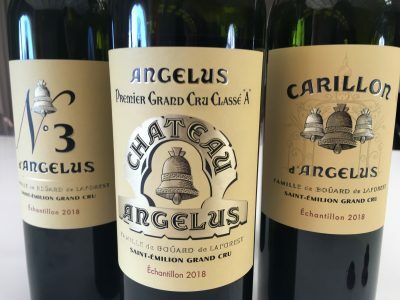 Other proprietary St Emilion’s tasted at Château Angélus included Château Daugay, Château Roc de Boisseau and Château Bellevue. Château Daugay is almost always too much of a good thing. This is certainly true of the 2018. This wine is a seductive beauty, with black cherry fruits and gorgeously ripe tannins. Château Roc de Boisseau had plenty of dark fruit and liqourice tones with new oak notes. Château Bellevue shows lots of unctuously styled red and black fruits and a bucket load of ripe tannins. 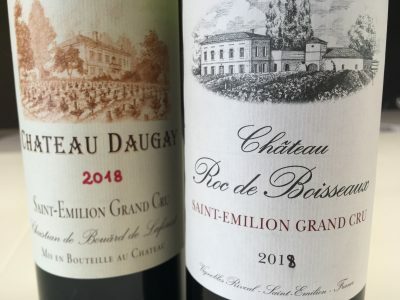 In Lalande de Pomerol, Château La Fleur de Boüard has turned in a typically vivacious and appealing wine. The concentrated Le Plus here will be high scoring amongst many critics – full of material and power with loads of ripe tannin on the finish. It is a giant statement as ever! Over in Montagne St Emilion, Coralie de Boüard’s Château Clos de Boüard looks very good in 2018. It is very attractive and polished with plenty of plummy fruit. Next up was my first visit to Château Laroque with winemaker David Suire. This is a fascinating property not far from Château Tertre Rotebeouf and Château Troplong Mondot, set in wonderfully commanding limestone and clay terroir. At 61 hectares it is big for St Emilion [though it was bigger historically]. The château itself is wonderfully grand. Clearly this is a property undergoing a quiet renaissance. David Suire also works with the Thienponts at Château Pavie Macquin, Château Larcis Ducasse and Château Beauséjour [HdL]. He’s been here at Laroque since 2015 and I reckon you can see his growing influence in the wines. The 2018 looks to be an outstanding effort. The fruit is beautifully pure and enticing with excellent texture. 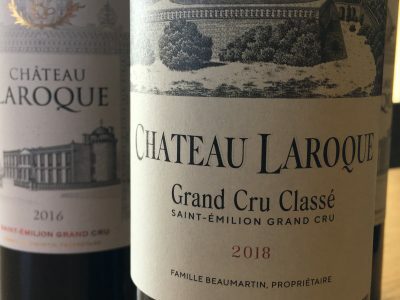 Château Laroque is certainly a property to watch and one which, at least for the moment, should prove affordable in this vintage.